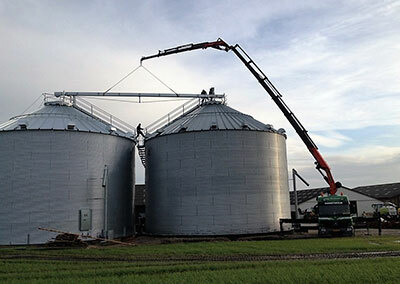 At Almas Korn A/S we facilitate, deliver and construct silo plants and transport/handling solutions for agriculture and industry. Our partners and we have more than 50 years of experience building these projects. To us, satisfied customers is the most important thing. This is why we strive to create the best solution every time. When the project is handed over, we provide the best service engineers, which means that help is never far away when it comes to maintenance and repair. 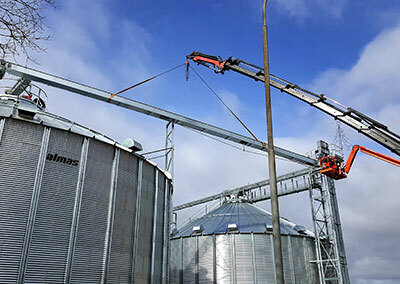 The company Almas Korn A/S was established in 2013, when the company bought the grain handling activities from ALMAS (Aalborg Maskinforretning). Almas Korn A/S is owned and run by four committed people, who all work at the company. Almas Corn Ltd. today has 15 employees in Aalestrup. Besides that, we are located in Eastern Danmark and Sweden. We have worked on projects all over Scandinavia, Germany, Poland, The Baltics, Belarus, Ukraine, Rumania etc. In the first state of the process, we listen closely to your needs and the settings of your project. In this initiating phase we act as consultants. Through our experience and expertise we find a solution in cooporation with you, that fits your needs. 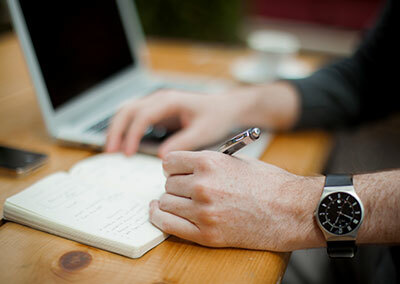 Afterwards we manage the administrative work relating your project. For example helping with alternative financing, or helping with various applications connected to the project. We manage all the practical work and execute the project in ongoing consultation with you. In the construction phase, everything also happen in close cooporation. Our skilled employees make sure all montage happen correctly. Afterwards, you are taken through every part of the project. In that way we make sure that everything is the way you want and live up to your expectations. We never leave a project before everything runs smoothly, and you are happy with the result. When the project is done, we never leave you on your own. We want to be your sparring partner, consultant and helper in all situations. We have a large service storage in West- and Eastern Denmark and in Sweden. In that way we are able to deliver spare parts quickly, if problems should occur. We have locally based service engineers, who are used to work independently, and are able to help you with your problems very quickly. Furthermore, we help you with free advise after the construction. The most important thing for us, is that your plant is running. We can be reached on our watch phone, when needed. Ready to begin a great relationship?